Members are reporting continued difficulties in obtaining the required supply from local steel mills. This has resulted in the non availability of certain diameters and consequent delays in the supply and fixing of cut and bent material from the reinforcing fabricators. This has in some cases negatively impacted on the progress on certain construction sites. In order to mitigate the shortage, imported reinforcing has been used where members were able to secure appropriate supplies. Whist this has, to a certain extent, alleviated some of the problems, it cannot be considered as a realistic long term solution due to the lead times and vagaries of the international steel market. There is concern however, as to the quality of imported steel. Association members have therefore been urged to pay particular attention to the conformance of imported steel to SANS 920 for supplies to the construction sector, and to initiate independent verification of test certificates supplied by manufacturers where necessary. 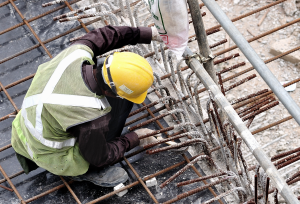 Member companies are addressing the quality issues with the suppliers concerned, and are taking all possible precautions to ensure that no defective material is supplied to the construction industry.